Mikey Artelle's Art and Puppetry Blog: Gordon the Sea Monster and Me! 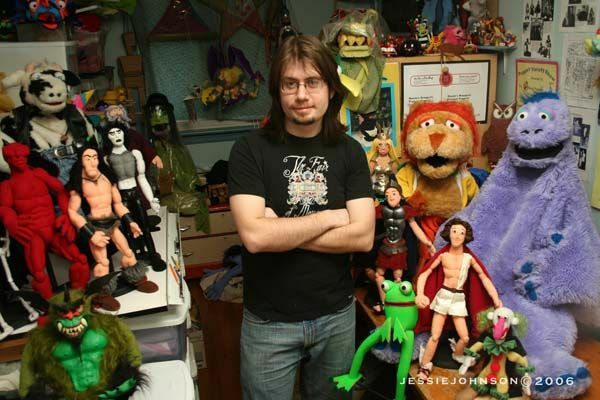 As a puppeteer I've created many puppet characters over the years. Some puppeteers think it's silly or unprofessional to become sentimental about their puppets, and consider them simply as props used to make a living. Me? I'm very sentimental about my puppets, but Gordon the Sea Monster is especially important to me. I created Gordon in 1990 when I was 16 years old, so you might say we've grown up together. Remarkably, we've now been hanging out for over 25 years! 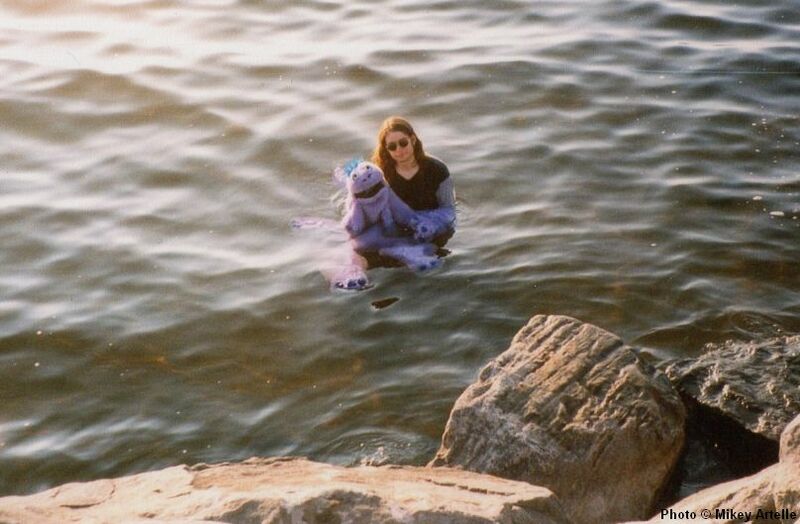 Below are some of my favourite photos with Gordon the Sea Monster, enjoy! 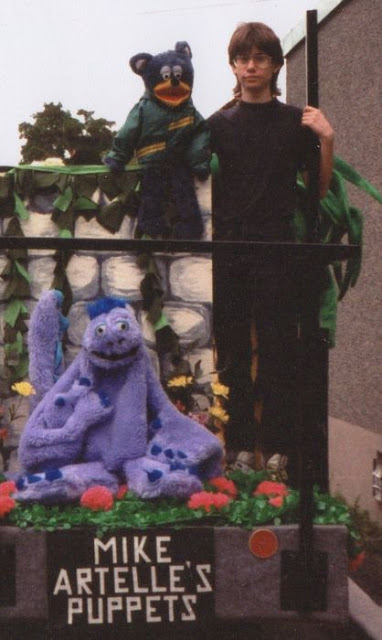 Gordon the Sea Monster, Tyler the Bear and I in the early 1990's during my late teens on a Westboro Parade float. This drawing was created in 1990 when I was 16, the same year that I made Gordon. 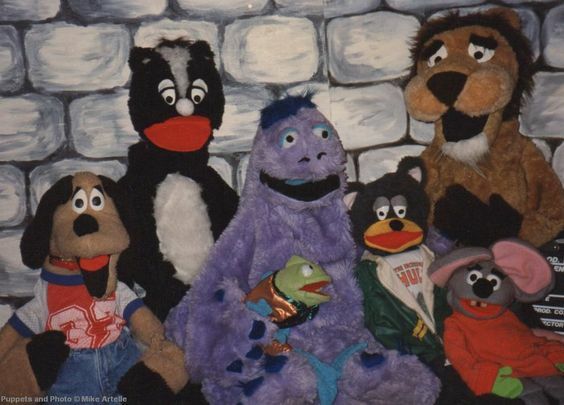 It shows my cast of main puppet characters at the time: Tyler the Bear, Rob the Slob, Gordon the Sea Monster, Bruno the Dog, and Mr. Noodlehead. 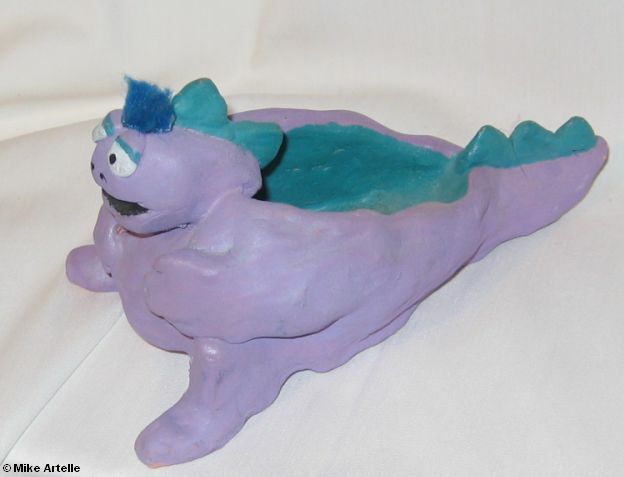 This is a Gordon the Sea Monster container that I made in high school as a pottery project for art class during the early 1990's. I also made a figure of Rob the Slob sitting on the side of a small dish, Bruno the Dog lying on the roof of his dog house (the roof was removable and the dog house was a container), and a container in the shape of Mr. Noodlehead's head, with the nose as the handle for the lid. These were all made at the same time. Unfortunately they all ended up getting damaged so I no longer have them, and it seems the only one I took a picture of was the Gordon container. Here's Tyler the Bear and Gordon the Sea Monster at Parliament Hill in Ottawa. This photo was taken as a high school photography class assignment in 1990 or 1991. 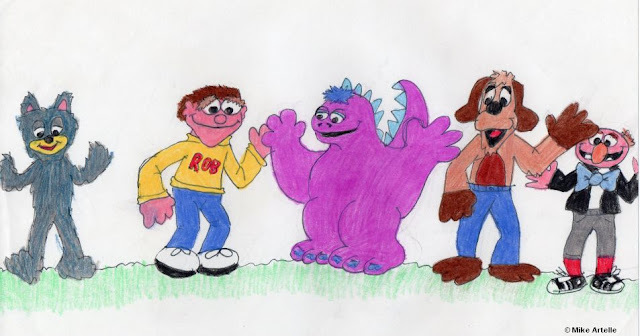 A drawing of my puppet characters, created in 1991. 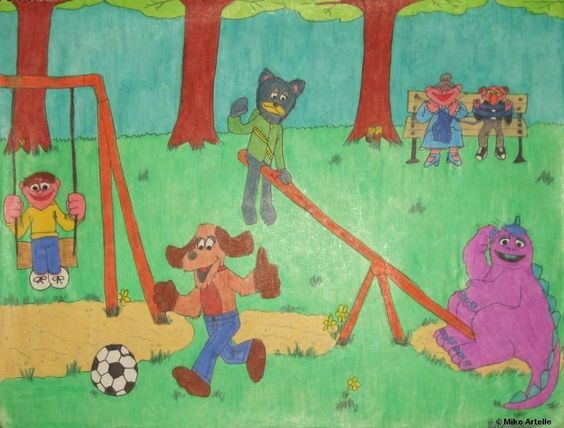 It shows Rob the Slob on the swing, Bruno the Dog with the soccer ball, Tyler the Bear at the top of the see-saw with Gordon the Sea Monster at the bottom. Nanny and Mr. Noodlehead are sitting on the bench. This was done in my sketch book so it was too big for my scanner and had to be photographed. Unfortunately the flash affected the colour in the centre of the drawing. 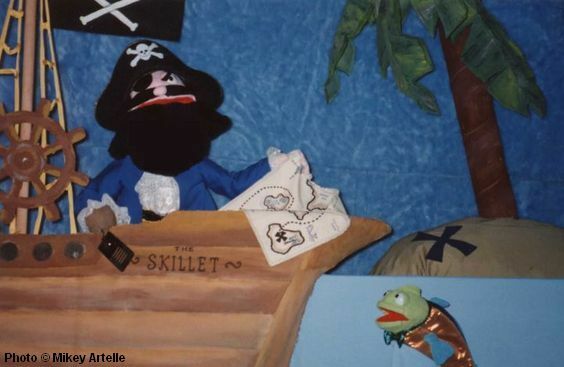 The first puppet show that I created for Gordon the Sea Monster in the early 1990's was "The Pirate Mice". Along with Mousie Mousie and her brother Peter Mouse the show featured a pirate named Captain Spatula who became Gordon's nemesis. I had built Captain Spatula in the late 1980s before I made Gordon, so this was the first time that they were paired up together. My mother and I liked thinking of funny pirate expressions for the Captain to say, such as "Blubberin' Blowfish!" or "Sufferin' Seahorse!". When Captain thinks someone is less intelligent than he is or has made a foolish mistake, he calls them a "Bumblin' Barnacle"! Mr. Fishy, seen above, was originally made for a puppet show based on "The Three Billy Goats". Gordon and Fishy teamed up for the first time in "The Pirate Mice" and have been best friends ever since! 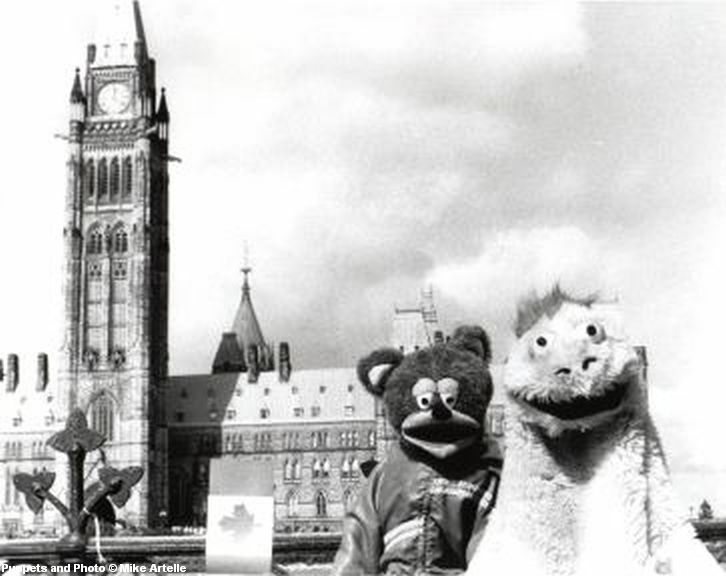 This group picture from the mid 1990's shows my main cast of puppet characters at that point. L to R: Bruno the Dog, Victor the Skunk, Gordon the Sea Monster, Mr. Fishy, Tyler the Bear, Brian the Lion and Mousie Mousie. 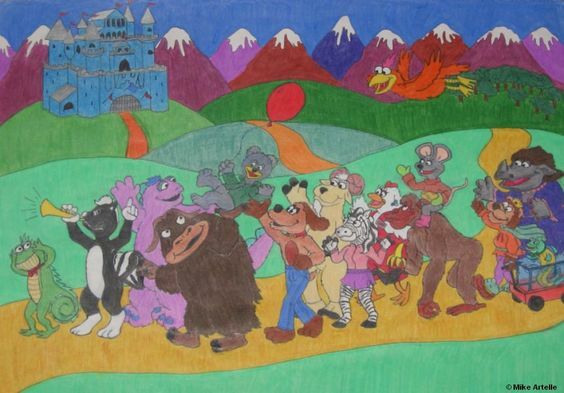 This illustration is titled "A Parade for Tyler the Bear", and was created in 1995. While working on finishing the script for a video project called "Fuzzy Fables: The Sea Monster and the King", I had begun to create and envision the world that the characters lived in. This drawing was part of that process. It shows several characters that I had already created as puppets, as well as several that I had planned to make as puppets but have yet to realize. One of the characters that has yet to become a puppet is the big brown Musk Ox holding up Tyler. His name is Wilbur Beast and he's so dim witted that he thinks he's an oxymoron. The puppet of Wilbur was going to have a body similar to Gordon the Sea Monster. At the front of the parade is Carlos Chameleon, followed by Victor the Skunk. Gordon the Sea Monster is behind Victor next to Wilber Beast. Tyler the Bear is being held up by everyone. Bruno the Dog is next followed by Rosanna Zebra. Behind her is Ramsey the Ram followed by a female chicken in red overalls named Spring Chicken. Next to her is Jake Ape with Mousie Mousie on his shoulders. The cute lion cub seen at the end of the parade pulling the wagon with Mr. Fishy in it is Prince Lynal the Lion. At the end of the parade is Rebecca Rhino the Royal Nanny from King Brian the Lion's castle which is in the background. I've forgotten the name of the orange bird flying above the parade. Out of all of these characters the ones that I made as puppets are Gordon, Tyler, Bruno, Ramsey, Mousie Mousie and Prince Lynal. 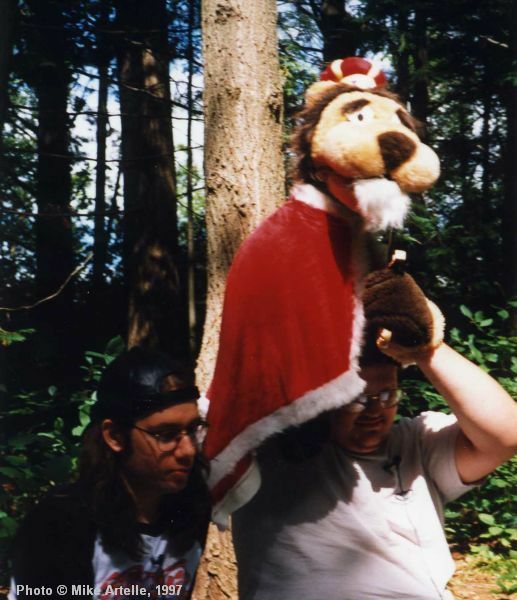 This picture was taken in 1996, when I was 23, at a puppet workshop in Mississippi Mills, ON that was instructed by puppeteer Bob Stutt. 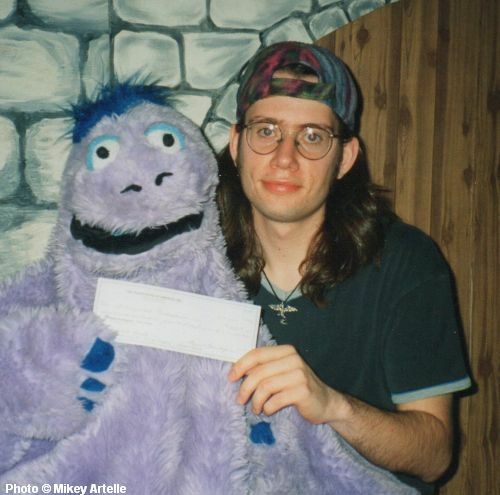 In 1997 I received a grant from the Puppeteers of America Endowment Fund for my video project "Fuzzy Fables: The Sea Monster and the King". The above photo shows Gordon and I holding the cheque for the award. Later on I learned through the grapevine that puppeteer George Latshaw, whom I had met two years prior at the 5th National Puppetry Conference held in Waterford Connecticut, was involved in some way with the Endowment Fund selection and had supported my application. That was quite an honour! 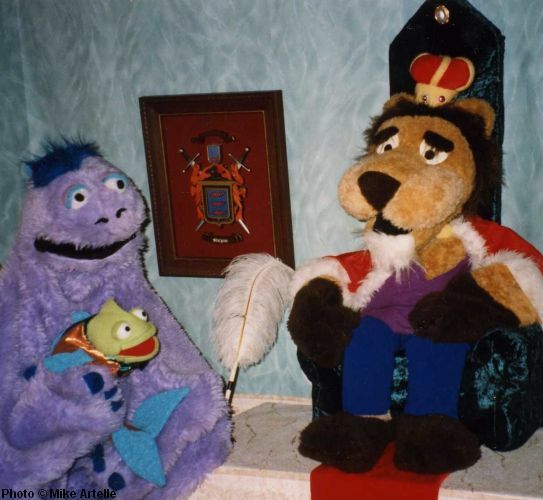 This is a scene from the above mentioned video, with Gordon the Sea Monster and King Brian the Lion as the two main characters. Gordon's pal Mr. Fishy also had a key role. Ned the Nasty Troll, who had been in my live show "The Three Billy Goats" returned as the villain. Here's a look behind the scenes during the making of the Fuzzy Fables video. I'm performing Gordon the Sea Monster while watching the monitor in front of me. Several of my friends helped out as puppeteers, while students from the Television Broadcasting program at Algonquin College and a workshop at Saw Video helped out with the technical aspects of the production. This is the crew on location at a park in Kanata, Ontario, which served as the forest where King Brian's castle was located. We shot there for about two or three days for a couple of hours at a time. The big guy in the skull T-shirt is Jay Young, the puppeteer who performed King Brian. The other three guys shown above are the production crew, Simon, Craig and Delaney. A camera operator named Rob also helped out on location. My friend Katrina was also a puppeteer for this project and performed Mr. Fishy. Here's Jay performing King Brian the Lion as we watch the monitor which is in front of us, just outside the lower right frame of this photo. Here is my friend Victor who helped with editing the video. He also created original music just for this project which was really awesome. The monitors show a scene from the very beginning of the video, with Gordon the Sea Monster sitting on the rocks at Britannia Beach in Ottawa. This being my first video project it unfortunately had a lot of technical problems, mainly with the sound and colour. We had to re-record most of the dialogue and dub it in to match up with the puppet's mouth movements, which was a real pain. I'd like to post it on YouTube evenutally. When that happens I'll add a link here. 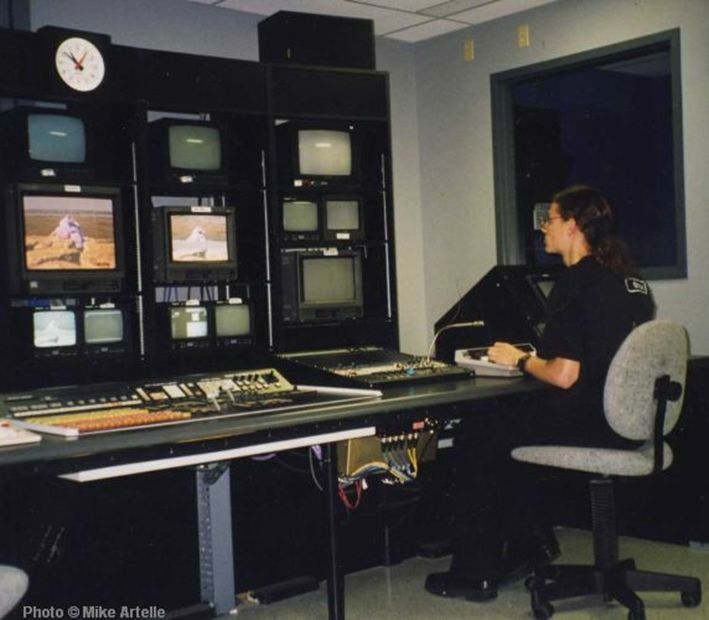 This photo is from 1997 when I was 24. After the above video project was finished I turned "The Sea Monster and the King" into a live show, with help from Jay performing King Brian. I used the scenery from "The Three Billy Goats" show and turned it into a castle with a jaw bridge. 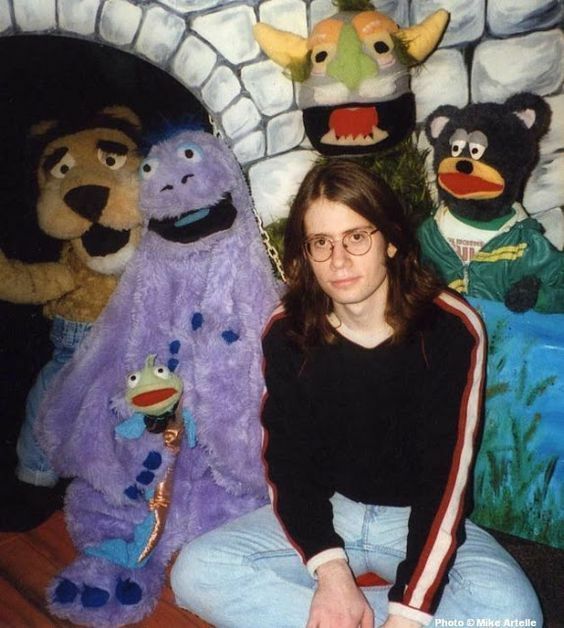 This group photo of me with the puppets is one of the few that I have showing any of the set from the live version. 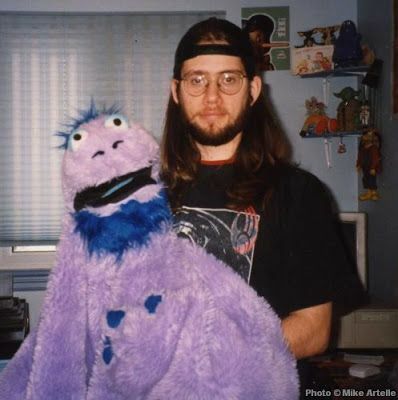 During my college years in the mid to late 1990's Gordon the Sea Monster and I grew out our beards! :) Gordon had signed up for a course on Cryptozoology but withdrew after the first week. He didn't like that the desk his teacher assigned him to was in fact the artifact examination table. This photo is from 2006 when I was 33. It was taken in my puppet studio by a photography student from Algonquin College. I constructed Gordon the Sea Monster out of carpet fabric that had a backing on it. In order to use the material I had to take the backing off which was very time consuming, but I liked the colour so it was worth it to me. Gordon has feet that I can wear or stuff depending on the performance. When I'm wearing his feet, ideally I use a chair on wheels so that he can walk around. This allows him to be performed at the same level as kids, so it's easier for them to pretend that he's real. Once in a while a kid will get a bit freaked out when they first see Gordon walking about. Usually those are the very, very young kids around 2 or 3 years old. 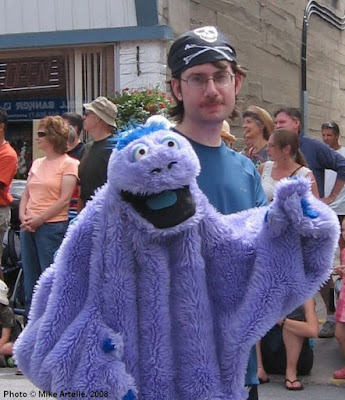 Fortunately, I haven't caused any puppet phobias that I know of... at least not yet! I pull Gordon away very quickly whenever I see a kid is reacting negatively to him. Afterwards, I like to make Gordon act shy and worried, so that the nervous kid will see that he's the same as them on the inside. Generally, kids are very smart and it's fun to watch as they figure out that I'm operating Gordon. Even after they learn that he's a puppet they keep talking to him, and often like to give Gordon hugs and kisses when they say goodbye. 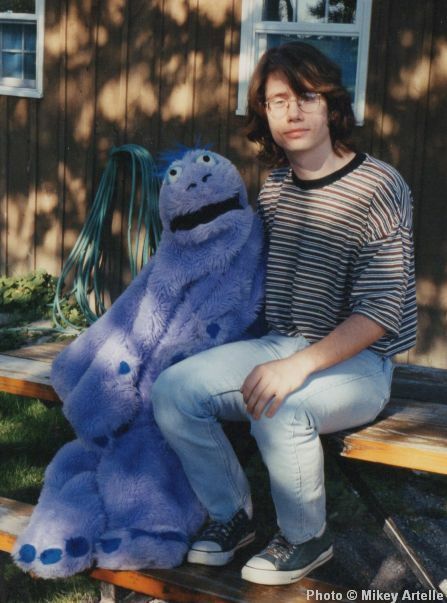 He's a very soft and huggable puppet who has made many young friends over the years. Gordon is an awesome puppet. I don't think that I've ever seen a sack puppet with legs before, it looks really cool.